Fluid retention is a condition in which the tissues of your body hold excess fluid. This can constrict arteries and blood vessels, which can contribute to high blood pressure. Fluid retention can also cause weight gain, and can contribute to the bloating and discomfort associated with premenstrual syndrome. Several foods may help flush excess fluid from your body. Talk to your doctor before altering your diet to address fluid retention. Asparagus grows in temperate areas of Europe and the United States. It is characterized by long, thin spears that have a firm texture. 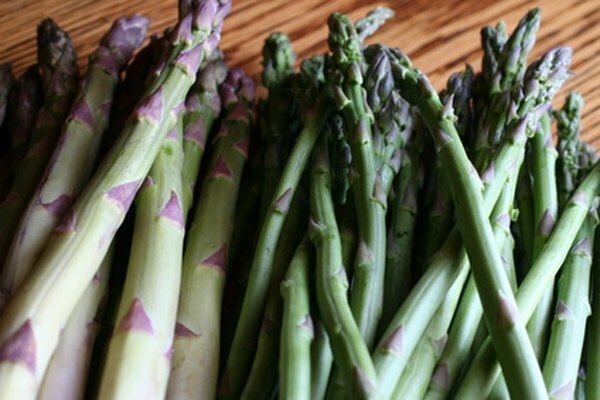 Asparagus is a natural diuretic that may help your body flush out excess fluid through urine. It is also a rich source of vitamin K, which may aid in the absorption of calcium and prevent excess bleeding from wounds and ulcers. Although parsley is primarily known as a garnish in the United States, this food has a variety of culinary and medicinal uses. Parsley lends an earthy flavor to Italian pasta dishes, soups and egg dishes. The ancient Greeks and Romans believed that parsley was an effective remedy for epilepsy. The chemical compounds in parsley also have diuretic properties, which may help you reduce water weight. Celery is native to western Europe and Asia, although it is now widely cultivated in the United States. It features prominently on vegetable trays in the United States and is also commonly used in green smoothies. The seeds of the celery plant are natural diuretics that may help remove excess fluids from your body. Although diuretic foods may help remove excess water weight, they may cause dehydration when used on a long-term basis. Also, diuretics may remove potassium from your body. Potassium helps maintain consistent blood pressure and improves your body's ability to deliver vitamins and nutrients to bone, organ and tissue cells.